Consider this scene: Steps from a resort I remember well, across a small crescent of hot white sand, still tropical water gently laps. Less than 10 metres/ 33 feet out, the bottom gives way to a sheer coral-festooned wall, which plummets into the abyss some 600 metres/2000 feet below. Sounds nice, right? 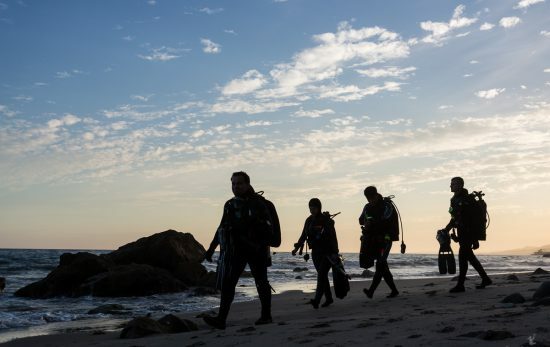 While shore diving isn’t always this easy, it’s often just as rewarding. 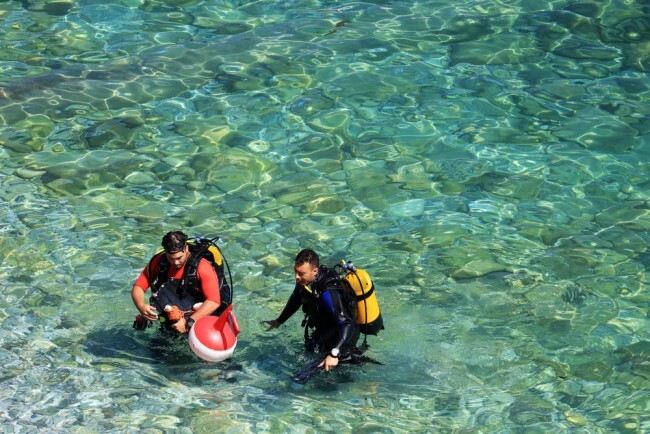 Here are a few things to make your next shore dive a bit easier. Make sure you can get out before you get in. While often not a major issue, this is particularly relevant on rocky shores in tidal regions. On a falling tide, that handy ledge you hopped off could well be a fair bit “higher” than when you entered. On surf beaches, especially steeply sloping ones, surf can build significantly as the tide rises. Don’t anguish over it, but make sure of your exit and have a contingency plan before committing. Plan ahead to keep the work level low. 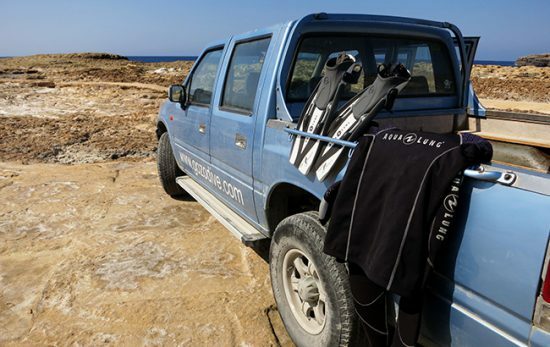 The most tiring part of many shore dives is simply getting to the entry point with all your gear. In often makes sense to walk directly from where you kit up to the water’s edge in full gear. In this case, make sure you’re in sync with your buddy so there’s no hanging around. Sometimes it’s easier to set up your scuba unit and bring it and your weight belt to the entry area before you suit up. Always take your time, or take a rest, so you’re nice and relaxed before you get in. Think about how and when you’ll put on and take off your fins. Wading out to waist deep water is ideal when conditions allow. You can let the water support you as you slip your fins on or use your buddy’s shoulder for support. To easily find your way back, line up a couple of obvious landmarks on your way out. You need a couple, one far behind the other, to make sure of your position along the shoreline. A distinctive tree close to shore and a church spire farther away are an ideal example. When these are inline, you know you are directly offshore of your entry/exit point. Stay down as long as possible. 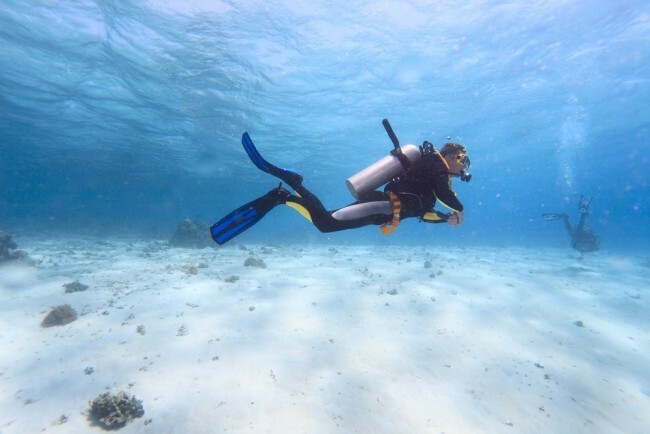 On a gradually sloping shoreline, it’s often possible (and fun) to stay on the bottom until you are in water less than a metre/three feet deep and take your fins off there. Swim on the surface if boat traffic or other water users make this a bad idea. Use your buddy to help you get to your feet and vice versa. 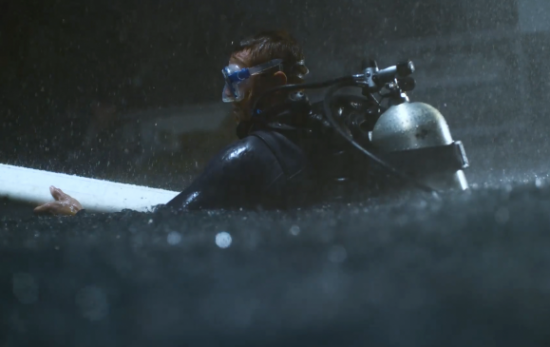 If there’s any doubt about getting up, stay down, keep your fins on and crawl out of the water on all fours. While it’s a bit ungainly, it works well. 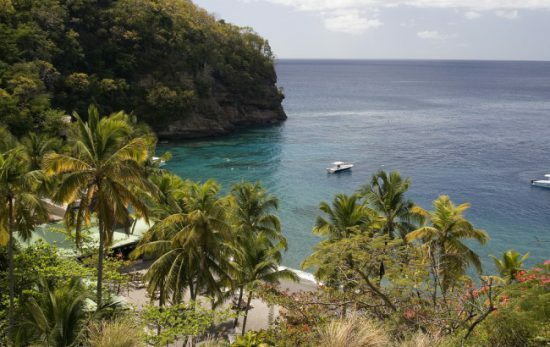 The next time you find yourself faced with a short trek across the beach to a coral reef in warm tropical water, take a moment to consider how these ideas can make your life a bit easier. They might also be handy when things get a bit more challenging. 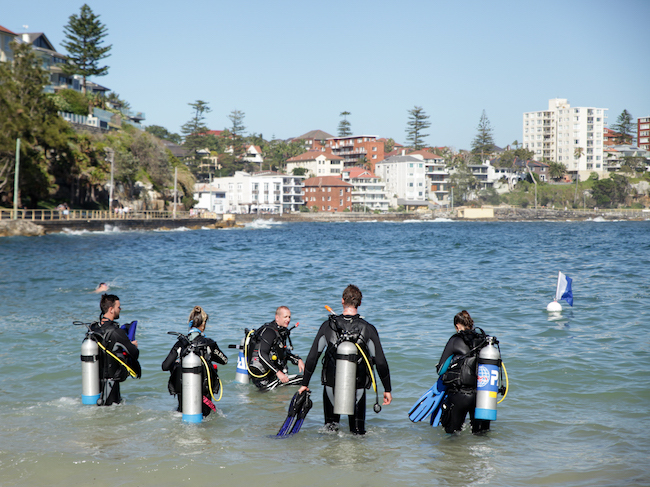 Ready for your next shore dive? 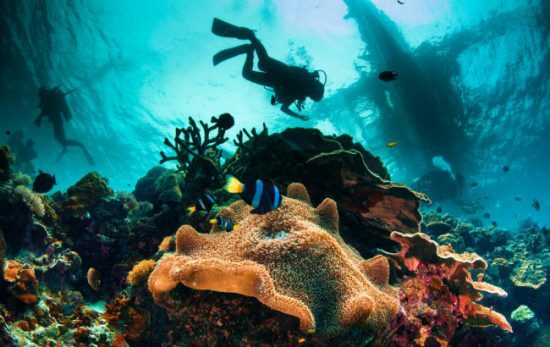 Check out these 7 shore dive sites and contact your local PADI Dive Center or Resort to find some shore dives near you.